Gold and oil take a dive - Boston bombs to blame? If you were thinking of going out to buy some gold jewellery any time soon, hold off until recent market movements trickle down to the stores. Gold has fallen to its lowest level in two years, dropping 9.2% to $1,395 per ounce. That should leave a few quid in your wallet next time you want to splash out on some bling. But it’s not just gold that’s taken a hit. Brent crude oil is down $2.29 to $100.75 a barrel, and even the main US stock index the Dow Jones fell 1.8% late yesterday. But wait, there’s more: copper fell to its lowest level in 18 months, and aluminium its lowest for three-and-a-half-years. What the hell’s happened, we hear you ask? Analysts are saying that the big commodities crash could be at least partly thanks to the explosions at the Boston marathon yesterday, which killed at least three people and injured about 140 more. The attack evoked memories of 9/11, when stock markets and commodity prices everywhere sunk low. 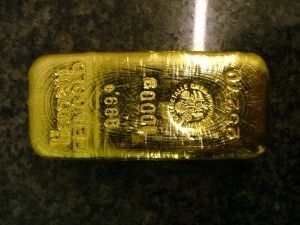 Although the more conventional thinking on this is that such events are more likely to result in rising gold prices. Others are saying that (specifically for gold) it could be because the US Federal Reserve is talking about stopping its quantitative easing programme altogether, meaning inflation will probably fall and investors will not be as keen on gold. Of course, Cyprus revealed last week that it is considering dumping its gold reserves on the market toraise extra cash for its bailout fund, meaning supply will temporarily heavily outstrip demand. Finally, there's also the (pretty problematic) issue that China's growth looks like it is not going to get back to where it was any time soon. As China is the main engine of consumption for commodities such as copper and aluminium, this could account for the dip in price.